^ 2.0 2.1 2.2 国家民委. 维吾尔族_中国概况_中国政府网. www.gov.cn. 2015-07-30 [2019-02-17]. （原始内容存档于2019-03-01）. ^ China. Ethnologue. [2019-02-28]. （原始内容存档于2018-12-26）. ^ Hammarström, Harald; Forkel, Robert; Haspelmath, Martin; Bank, Sebastian (编). Uighur. Glottolog 2.7. Jena: Max Planck Institute for the Science of Human History. 2016. ^ Hahn, Reinard F. Uyghur. (编) Lars Johanson, Éva Csató. The Turkic Languages. Taylor & Francis. 1998: 379 [2019-02-28]. ISBN 9780415082006. （原始内容存档于2016-08-01）. ^ Robert Lindsay(罗伯特·林赛). Mutual Intelligibility Among the Turkic Languages 突厥语言之间互通程度探究 (PDF). Beyond Highbrow. 2010 （英语）. ^ 9.0 9.1 易斌. 现代维吾尔语的元音和谐形式及其特点. 民族语文. 2006, (2): 51–53. doi:10.3969/j.issn.0257-5779.2006.02.008. ^ L.A. Grenoble. Language Policy in the Soviet Union. Springer Science & Business Media. 11 April 2006: 149–. ISBN 978-0-306-48083-6. ^ Arik, Kagan. Austin, Peter, 编. One Thousand Languages: Living, Endangered, and Lost illustrated. University of California Press. 2008: 145 [2014-03-10]. ISBN 0520255607. （原始内容存档于2014-06-26）. ^ Clauson 1965, p. 57. ^ Edmund Herzig. The Age of the Seljuqs. I.B.Tauris. 2014-11-30: 23– [2019-02-28]. ISBN 978-1-78076-947-9. （原始内容存档于2016-05-18）. ^ 张春海. 突厥语族：跨越千年 广被万里. ex.cssn.cn. 中国社会科学报. 2015-03-18 [2019-02-26]. （原始内容存档于2019-03-01）. ^ 27.0 27.1 Uyghur. Ethnologue. [2012-04-06]. （原始内容存档于2012-03-21）. 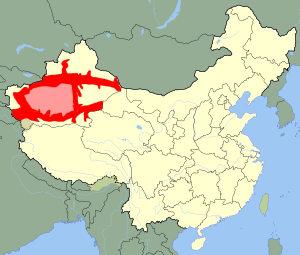 ^ Uyghur. Omniglot. [2012-04-06]. （原始内容存档于2012-03-24）. ^ Hann, Chris. Smith in Beijing, Stalin in Urumchi: Ethnicity, political economy, and violence in Xinjiang, 1759-2009. Focaal—Journal of Global and Historical Anthropology. 2011, (60): 112. ^ Su, Alice. A Muslim Minority Keeps Clashing With the 'China Dream' in the Country's Increasingly Wild West. Vice News. Vice News. 2015-12-08 [2016-09-22]. （原始内容存档于2016-01-21）. ^ 国家民委. 乌孜别克族_中国概况_中国政府网. www.gov.cn. 2015-07-30 [2019-02-17]. （原始内容存档于2017-10-19）. ^ 张雨楠. 乌孜别克语 “芳踪”已难觅. 中国社会科学报. 2015. （原始内容存档于2019-02-19）. ^ 阿达来提. 中国乌孜别克族语言使用现状研究. 中央民族大学. 2013 [2019-02-17]. （原始内容存档于2013-10-24）. ^ 陈宗振. 制定“拼音方案”势在必行──破解处于濒危状态的五种突厥语族语言无文字的状况. 中国社会科学报. 2014年10月10日, (654). （原始内容存档于2019-02-19）. ^ 乌鲁木齐“冬闲”不闲　维吾尔语班走俏-中国搜索头条. toutiao.chinaso.com. [2019-02-28]. （原始内容存档于2019-03-01）. ^ 走进“课堂”学维吾尔语 _滚动读报_教育频道 _光明网. edu.gmw.cn. [2019-02-28]. （原始内容存档于2019-03-01）. ^ 山东省援疆指挥部组织援疆干部学习维吾尔语 - 新疆天山网. www.ts.cn. [2019-02-28]. （原始内容存档于2019-02-23）. ^ 维吾尔语说得“溜”的援疆干部--新疆频道--人民网. xj.people.com.cn. [2019-02-28]. （原始内容存档于2019-02-23）. ^ Ingram, Ruth. The Orwellian Life in Xinjiang Campuses. Bitter Winter. 2018-12-28 [2019-01-03]. （原始内容存档于2019-01-03）. ^ Byler, Darren. The ‘Patriotism’ Of Not Speaking Uyghur. SupChina. 2019-01-02 [2019-01-03]. （原始内容存档于2019-01-03）. ^ 42.0 42.1 42.2 邓浩. 论现代维吾尔语语素的语音. 喀什大学学报. 1989, (3): 54–74. ^ 程试. 关于维吾尔语的格位范畴. 新疆大学学报(哲学•人文社会科学汉文版). 1978, (1): 89–100 [2019-02-25]. （原始内容存档于2019-03-01）. 米娜瓦尔·艾比不拉. 维吾尔语方言和语言调查. 北京: 民族出版社. 2004-09 [2019-02-25]. ISBN 7-105-06170-7.